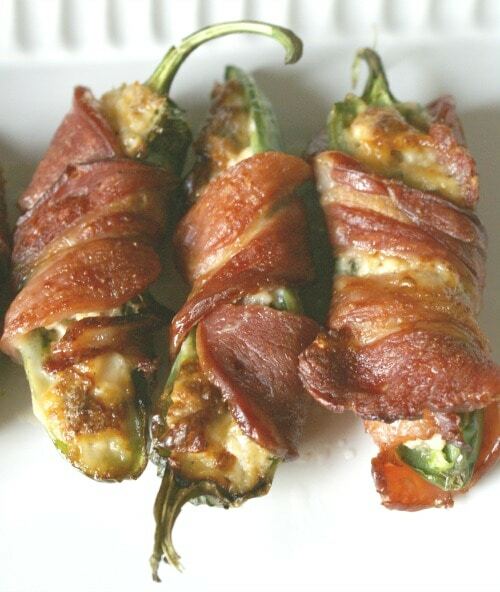 Bacon Wrapped Sausage Jalapeno Poppers are just plain delightful! You have a group of ingredients that work together like magic….bacon, sausage, cream cheese, jalapenos…what's not to love! We have some friends that make these and have brought them to parties and they are always gobbled right up! I decided I needed to make them myself so I can have them whenever the mood hits! I know that America has a “bacon” obsession lately. Jumping on every bandwagon that comes along isn't always my style, but adding bacon really can take a recipe from good to great! Some people think of a Jalapeno Popper and immediately think the popper will be too hot and spicy. That is not the case with this recipe. Removing all the seeds and “inner” parts of the Jalapeno takes the majority of the heat out. I think the key when wrapping food in bacon is to get the bacon nice and cooked. I do not like fatty bacon. If the bacon is cooked nicely you won't have any chewy, fatty pieces. The sausage is a very nice addition to this recipe. 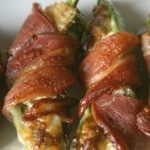 It gives the Jalapeno Popper an extra level of flavor and blends so well with the cheeses inside! You can use spicy or regular sausage. I used spicy and it added flavor but not too much heat. One thing to keep in mind when you make this recipe is the number of jalapenos you will need. It depends a lot on what size peppers you find. If you only find smaller peppers you may need more of them because they won't hold as much filling! A really important thing to remember when baking these Jalapeno Poppers is that you must use the right kind of pan! The best way to make these in the regular oven is to use a Roast and Broil Pan with a Nonstick Rack. This type of pan has a rack that fits into a roasting pan. It is oven safe and allows the grease to drop down into the pan and away from your food! If you just bake these in a regular baking dish they will end up swimming in bacon grease and will not turn out like you want!! I make the Jalapeno Poppers in my Nuwave Oven and it takes about 15 minutes for the bacon to get really crispy. They turn out wonderful and all the racks and trays can be thrown right into the dishwasher!! I hope you enjoy these tasty Bacon Wrapped Sausage Jalapeno Poppers as much as we do. This is one of our favorites along with Jalapeno Popper Mini Cheeseballs….can you tell I like the spice?? 🙂 Check out all my recipes HERE! A delightful appetizer with the right balance of heat and cheese! Brown your sausage in a skillet and drain off any excess grease. Place browned sausage, cream cheese and shredded cheese in a mixing bowl and mix together well. Cut all the Jalapeno peppers in half lengthwise. Remove all seeds and I like to scrap off the ribs inside the pepper as well. Stuff each pepper half with the sausage and cheese mixture. Wrap each stuffed pepper half with a slice of bacon. Use toothpicks to secure the bacon. I use several toothpicks if necessary. Place the bacon wrapped poppers on a oven safe rack over a baking pan that can catch the bacon grease as they cook. Cook for 15-25 minutes or until bacon is brown and crispy. It is very important that these cook in a way that will allow the bacon grease to drip down away from the poppers. Otherwise the poppers will end up being very greasy. You can use spicy sausage to add even more flavor. You can cook these in a Nuwave oven for about 15 minutes. My husband actually ate several of these for breakfast recently…they are good leftover!! Yum! I’ve made poppers many times, but never with sausage! Great idea! These are one of my favorites!! I love love love them!! Great for parties with family or even a super bowl party! This looks sooo yummy! Definitely trying it. Pinned! And making these very soon! You had me at bacon. This looks so yummy. Much better than regular poppers. OH MY I want to eat all of these! This looks delicious. I will have to put this on the list for my husband to cook. Bacon on almost anything is a winner! These look delicious! I have the same and love it! I’ll definitely give this jalapeno a try. It looks amazing. Thanks for sharing your recipe in our Sunday Recipe Wrap Up Linky! I like making these. For me they last two days. I also put ground peppers in the sausage and cream chesse.